Profits at the John Lewis Partnership have fallen to almost zero in the first half of the year as its department store chain matched discounting “extravaganza days” by rivals. 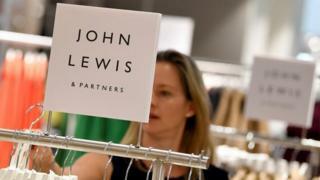 John Lewis Partnership chairman Sir Charlie Mayfield said the retail sector was facing “challenging times”. Its results, which include Waitrose, showed profits for the six months to 28 July sank 99% from last year to £1.2m. The retailer also warned that full-year profits would be “substantially lower”. The company is rebranding its stores to John Lewis & Partners and Waitrose & Partners to highlight the chain’s 85,000 members of staff, known as “partners” who are given an annual bonus based on the chain’s profits. “With the level of uncertainty facing consumers and the economy, in part due to ongoing Brexit negotiations, forecasting is particularly difficult but we continue to expect full year profits to be substantially lower than last year for the partnership as a whole,” the retailer said. In the first six months, profits at the John Lewis department store business were hit hardest. Sir Charlie said that the stores’ profit margins had been squeezed in “what has been the most promotional market we’ve seen in almost a decade”. He told the BBC’s Today programme: “The biggest single reason for the decline in profits is all about margin”. The department store pledges to be “never knowingly undersold” – cutting prices to match those of competitors, which have also been discounting. “This year there has been twice as many extravaganza days as there were a year ago and actually the discounts have been even deeper,” he said. It was an “extremely valuable” promise, he added. Sir Charlie said the chain had also not been passing on to consumers all of the inflationary impact from the weakness in sterling. The pound has slumped since the vote to leave the EU, pushing up the cost of imported produce. Analysts said the results demonstrated the impact of the price-matching promise. Steve Dresser, retail analyst at Grocery Insight, tweeted that “the business feels like it’s broken”, adding that the never knowingly undersold pledge “needs refining, badly”. The department store sector has been undergoing a period of change. Sports Direct bought House of Fraser in August while Debenhams, in which Sports Direct has a 29.7% stake, was this week forced to stress that its sales had not collapsed. Sport Direct has also been forced to deny that it does intend to make a full bid for Debenhams. Julie Palmer, partner at Begbies Traynor, said the profits fall at John Lewis heralded further problems for the retail sector. “This brand was hailed as the model to which all should follow, and as a commercial and customer success – make no mistake, for the high street this is as significant as the fall of the Roman empire. For most of the last decade John Lewis appeared to defy gravity. While its High Street rivals were brought crashing down by the combined pull of the internet and ever-higher costs, it seemed to sail serenely on, smartly moving sales online while keeping customers coming to its stores. Now gravity has finally exerted itself. John Lewis sold £5.5bn worth of goods in the first six months of this year, and made just £1.2m profit – close enough to nothing. The partnership’s chairman, Sir Charlie Mayfield, has rejected the obvious response. This is not the time, he said, to be cutting back, closing stores and stopping investment. Instead, he has stepped up investment in stores, while also husbanding costs, as can be seen in a review of the future of the retailer’s final-salary pension scheme. Sir Charlie’s main strategic move, however, is hidden in the fine print of the financial statements. He is paying down John Lewis’s debt as fast as he can. In a downturn this severe, the last person standing is often the winner – and by getting rid of debt, Sir Charles is doing his best to make sure that is John Lewis. Like-for-like sales – which strip out new floor space – at the John Lewis stores fell 1.2%, and it reported an underlying operating loss of £19m compared with a £54m profit a year earlier. At Waitrose, like-for-like sales were up 2.6%, but operating profits fell 12% to £96.4m. The group had warned in June that its half-year profits would be wiped out and that it would invest more in developing “unique” products and services, as well as placing more emphasis on its own brand. It said it would continue to invest between £400m and £500m per year in the business. Sir Charlie said: “You don’t succeed by retrenching so if anything we are investing more and pushing on with differentiation.